By Alex Leslie | Yesterday I read at a poetry event honouring the work of Chief Dan George — the reading was part of the Salish Sea summer gathering hosted by the Tsleil Waututh nation in the Burrard Inlet, not far from where I grew up in Vancouver. The Tsleil Waututh are currently fighting Kinder Morgan’s proposed pipeline expansion in their territory. I was asked to read some of Chief Dan George’s work and to respond in whatever way I wished. I wrote a poem, which you can read following the photographs. With the environmental disaster at Mount Polley in the news, my poem is also a response to those events. Wil George of the Tsleil Waututh was part of the reading and reminded all of us before he read that Chief Dan George’s writings are not poems in the Western sense, but are teachings and teaching stories from the ancestors. 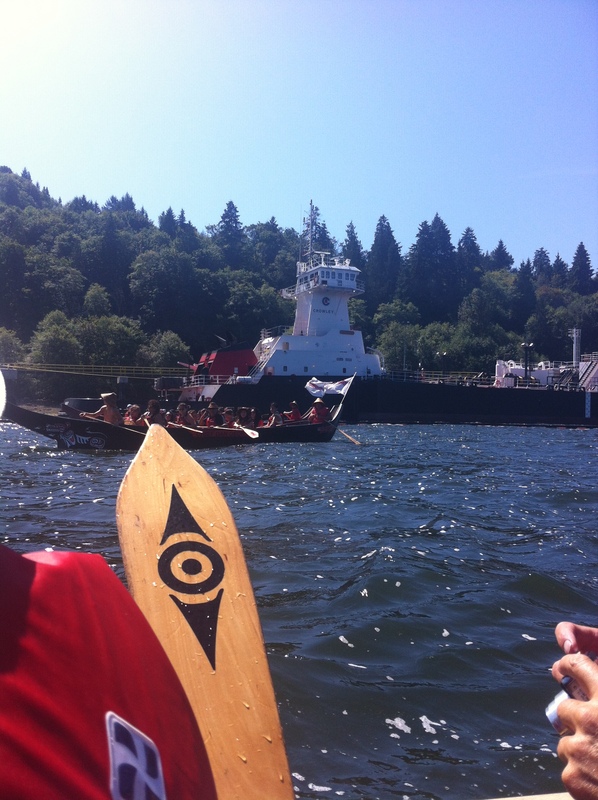 Before the reading, the poets were invited to paddle with the Tsleil Waututh across the Inlet to the Kinder Morgan plant as part of a ceremony that preceded the festival. 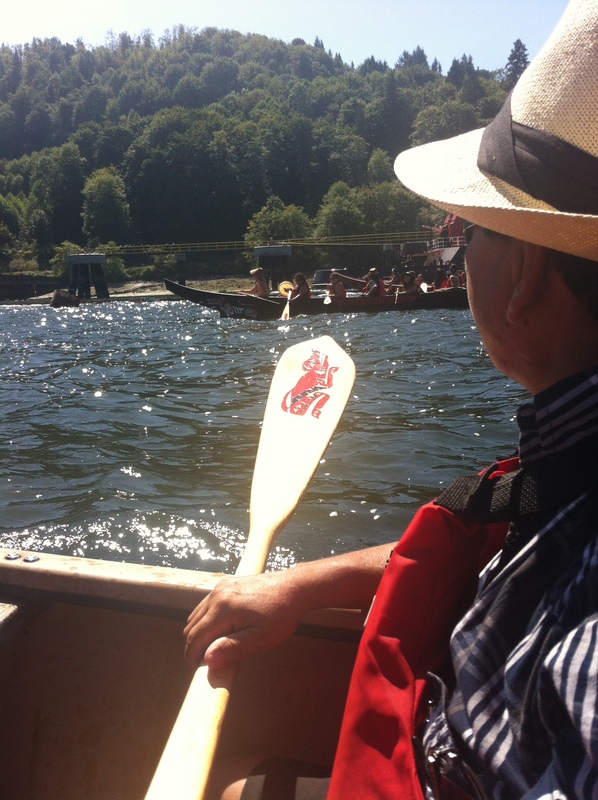 As a non-Aboriginal person who is a lifelong resident of the Lower Mainland, I was honoured to be part of this canoe journey with the original keepers of the waters. For me, the invitation to speak to Chief Dan George’s words felt connected to the invitation to be part of this paddling journey. Thank you to the Tsleil Waututh for being gracious hosts and for giving me the opportunity to contribute my writing to their resistance. 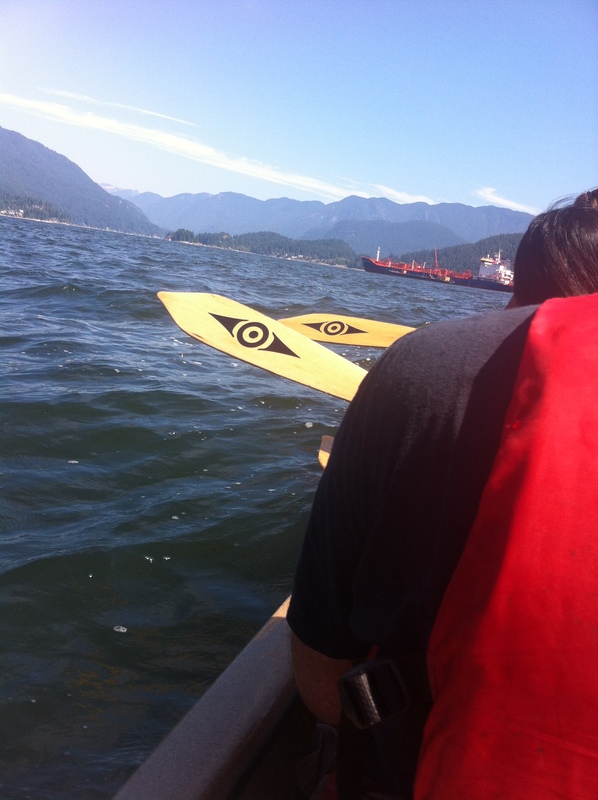 The ceremony carried out by a Tsleil Waututh elder during the canoe journey reminded me on the many forms that resistance takes and that these water have their own ways of healing. cannot be impounded. So you must be choked.